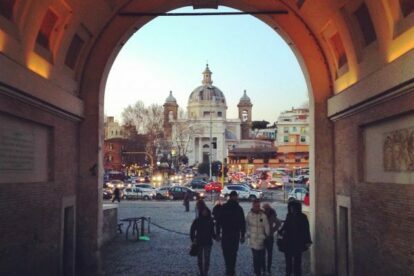 Ponte Milvio is not just Rome’s oldest bridge, it is also commonly referred to as the place where Christianity prevailed as the religion of the Roman Empire and is arguably the bridge that brought lover’s lockets to bridges and lampposts around the world. Originally built in 200BC, it was the site of the important Battle of the Milvian Bridge in 300AD between Constantine the Great and Emperor Maxentius (who ruled over a pagan Rome). The story says that Constantine, who was an early Christian ruler, prayed with his troops before the battle and saw a cross appear in the sky with the inscription “By this sign, you will conquer”. Constantine won the battle and spread the Christian belief throughout his new empire. Today Ponte Milvio is the meeting place of young Romans who exchange kisses on the bridge or enjoy beers with their friends. The bridge was popularized in an Italian romance novel called “Tre Metri Sopra il Cielo” (Three Meters Above the Sky) in which lovers attach padlocks with their initials on the bridge and throw away the key as a symbol of their affection. You are bound to see several locks when you visit. Ponte Milvio is also the name of the neighborhood just north of the bridge which is famous for being one of the centers of Roman “movida” (nightlife). Come for aperitivo and stay for dinner at one of the many restaurants in the area!